This service will be posted to your email adress regular. APECS education & outreach event - Bringing the Poles to Brussels! The Australian Antarctic Data Centre (AADC) Manager is responsible for all aspects of leadership and management of the AADC and the services it provides, including coordination of the Australian Antarctic mapping program. The AADC incorporates staff with data management, mapping, GIS, and applications development expertise. Please see the Job Description and Applying for a position for further information on how to apply. New Call Deadline: 15th October, 2015 (17:00 UK time). The SYNTHESYS Office is pleased to announce the third call for applications of the SYNTHESYS3 project under the current European Commission's FPVII European-funded Integrating Activities funding scheme. SYNTHESYS Access funding is available to provide scientists (Users) based in European Member, Associate and Candidate States to undertake short visits to utilise the infrastructure (comprising the collections, staff expertise and analytical facilities) at one of the 18 partner institutions (see full list below) for the purposes of their research. This is the third of four annual calls for applications during the project’s four-year duration. Access Call 3 will officially open for applications on 16th July 2015. The Call 3 deadline will be 17:00 (UK time) Thursday 15th October, 2015 and awarded visits must take place within 2016 (calendar year). The 18 partner institutions are organised into 11 national TAFs. TAF Users will be hosted by a TAF staff member (Host). Austria, Belgium, Bulgaria, Croatia, Cyprus, Czech Republic, Denmark (including Greenland), Estonia, Finland, France (including Guadeloupe, Martinique, Guyane, La Réunion), Germany, Greece, Hungary, Ireland, Italy, Latvia, Lithuania, Luxembourg, Malta, Netherlands, Poland, Portugal, Romania, Slovakia, Slovenia, Spain, Sweden, United Kingdom. Albania, Bosnia & Herzegovina, Faroe Islands, FYR Macedonia, Iceland, Israel, Liechtenstein, Montenegro, Norway, Republic of Moldova Republic of Serbia, Switzerland and Turkey. The 2015 AGU Fall Meeting will be held in San Francisco from 14-18 December 2015 (http://fallmeeting.agu.org/2015/). Eileen Hofmann, Sam Jaccard, Joellen Russell and I are co-convening the session (OS #21) entitled Trajectories of change in the Southern Ocean. This session is a contribution to the IGBP celebration synthesis and is co-convened by the IMBER, SOLAS and PAGES core projects of the IGBP. We invite you to contribute a paper to this interdisciplinary session. The Southern Ocean is a critical part of the Earth system and host to unique and diverse marine ecosystems. The region is experiencing rapid changes as the climate continues to warm: dynamic and thermodynamic processes are affecting sea-ice cover, oceanographic processes, atmosphere-ice-ocean interactions as well as the Antarctic ice sheet. How will these changes alter the Southern Ocean's ability to absorb heat, carbon dioxide and support ocean productivity? Will the changes result in feedbacks that accelerate or slow the rate of climate change? This session will address such questions by assessing recent insights from contemporary and palaeoclimatic observations and models. We solicit integrative contributions that explore topics such as sea ice, ice-sheet stability, biogeochemical cycling, atmosphere-ice-ocean processes and marine food webs. We will also consider contributions that explore the current and potential value of Antarctic ecosystem services and how they can be safeguarded. Managing the SCAR Secretariat efficiently and effectively. Any additional questions can be addressed to the current Executive Director, Dr Mike Sparrow (mds68@cam.ac.uk). Following the succesfull closure of the Dutch story call, APECS Belgium (Association of Polar Early Career Scientists) and BELSPO launch the French story contest for students from the 5th and 6th grade. If you are a student from the 5th and 6th grade fascinated by Antarctica, don't hesitate to participate to the contest, individually or with your class! At the occasion of "Antarctica Day" - 1 December, the day in 1959 on which the Antarctic Treaty was signed - APECS Belgium (Association of Polar Early Career Scientists) and BELSPO launched a story contest for students from the 5th and 6th grade. Numerous Dutch stories were received, which were evaluated by APECS members and BELSPO based on originality, plot, writing style and link with Antarctica. 10 winning stories were selected. The winning applicants will be rewarded. After practical arrangements with the teacher, two scientists will visit every class with a winning story, to talk in an interactive and engaging way about their work and interest in the Antarctic. Furthermore, the winning stories will be published in a book. Since the contest for the French stories will be extended to next school year, the book which will contain both the Dutch and French stories, will be published later. In the meantime you can read the winning stories here, so that everyone can read them and can enjoy the adventures! We wish to thank all participating schools and children for their commitment and participation. We immensely enjoyed reading the many stories! Ter gelegenheid van "Antarctica Dag" - 1 December, de dag waarop in 1959 het Antarcticaverdrag werd ondertekend - werd door APECS Belgium (Association of Polar Early Career Scientists) en BELSPO een verhalenwedstrijd gelanceerd voor studenten uit het 5e en 6e leerjaar. Talloze Nederlandstalige verhalen werden ingestuurd en geëvalueerd door APECS leden en BELSPO, op basis van originaliteit, verhalenwending, schrijfstijl en de link met Antarctica. 10 winnende verhalen werden geselecteerd. The gewonnen indieners krijgen een prijs. Na praktische afspraken met de leraar zullen 2 onderzoekers elke klas met een winnend verhaal bezoeken, om er op een interactieve en boeiende manier te vertellen over hun werk en interesse in Antarctica. De winnende verhalen zullen eveneens gepubliceerd worden in een boek. Aangezien de wedstrijd voor de Franstalige verhalen verlengd wordt tot volgend schooljaar, zal het boek - dat zowel de Nederlandstalige als Franstalige verhalen zal bevatten - later verschijnen. Ondertussen kan je de winnende verhalen hier lezen, zodat iedereen hen kan lezen en van de avonturen kan genieten. Wij wensen alle deelnemende scholen en alle kinderen van harte te bedanken voor hun inzet en deelname. We hebben enorm genoten van het lezen van de vele verhalen. A l'occasion du "Antarctica Day" - 1er décember, le jour où le Traité Antarctique a été signé - APECS Belgique (Association of Polar Early Career Scientists) et BELSPO ont lancé un concours de nouvelles pour étudiants du 5e et du 6e primaire. De nombreuses histoires en néerlandais ont été reçues et évaluées par les membres d'APECS et de BELSPO, évaluation basée sur l'originalité, l'intrigue, le style d'écriture et le lien avec l'Antarctique. Les candidats gagnants seront récompensés. Après contact avec l'enseignant, deux scientifiques iront visiter chaque classe avec une histoire gagnante, pour parler de manière interactive et dynamique de leur travail et de leur intérêt pour l'Antarctique. Par ailleurs, les récits gagnants seront publiés dans un livre. Etant donné que le concours pour les nouvelles francophones est prolongé à la prochaine année scolaire, le livre qui contiendra à la fois les histoires en néerlandais et en français sera publié plus tard. En attendant, afin que chacun puisse profiter de ces aventures, vous pouvez lire les histoire gagnantes via ce lien. Nous tenons à remercier toutes les écoles participantes et les enfants pour leur engagement et leur participation. Nous avons immensément apprécié la lecture de ces nombreuses histoires! You are based in a Member State or Associated State at the time of application and until your SYNTHESYS visit is complete in the 2015 calendar year. The SYNTHESYS project funds access to chosen institution(s) to study the collection(s) of 17 partner institutions throughout Europe. On 1 December, "Antarctica Day" is celebrated worldwide. On this day in 1959, the Antarctic Treaty was signed, dedicating the Antarctic continent to peacefull and scientific purposes only. After a succesfull workshop at BELSPO on Friday 29 November to commemorate this day, APECS Belgium (Association of Polar Early Career Scientists) and BELSPO launch a story contest for students from the 5th and 6th grade. The INTERACT project under EU FP7 has a Transnational Access program that offers access to 20 research stations in the northernmost Europe and Russian Federation. The sites represent a variety of glacier, mountain, tundra, boreal forest, peatland and freshwater ecosystems, providing opportunities for researchers from natural sciences to human dimension. The call for proposals is open at the INTERACT website http://www.eu-interact.org/ on 1st August – 30th September 2013 for access visits taking place between Oct 2013 and Oct 2014. Transnational Access is available to user groups, where the group leader and majority of group members work in an institution established in a EU Member State or Associated State. The maximum amount of access per user group is 90 person-days, including previously granted INTERACT Transnational Access. You can find the eligibility rules and application instructions, stations available in the cal, descriptions of stations and their facilities, and registration to the on-line application system from the INTERACT website. For additional information, please visit the INTERACT website or contact WP4 coordinator Hannele Savela, hannele.savela@oulu.fi, or WP4 leader Kirsi Latola, kirsi.latola@oulu.fi. This will be the last INTERACT Transnational Access call for the current funding period. Act now to seize the opportunity, and apply INTERACT Transnational Access to conduct research at the coolest places of the North! October 9-11 2013, National Research Council (CNR), Rome – Italy. The seminar brings together scientists who have Svalbard as a base for their research and monitoring activities. The aim of the meeting is to exchange scientific results, advancements, ideas and experiences to inspire each other and develop Ny-Ålesund further. We would like to announce the upcoming national Polar Symposium that will take place at the Ministry of Foreign Affairs in The Hague on 1st November this year. The symposium is entitled “Polar science and policy: a happy marriage?” and will focus on the policy and economic relevance of (Dutch) Polar science. To what extend is Dutch polar science influencing the Arctic Council and the Antarctic Consultative Meetings? How can the working relationship between Dutch Polar scientists and Dutch Polar policy makers be strengthened? How relevant is Dutch polar research for the business community? During the symposium there will be keynote speakers and an open discussion forum. We also invite you to submit a poster regarding the policy relevance of your research, or the value of your polar science project for Dutch business. Attention will be paid to making preparations for a new policy driven call, as another NWO policy driven call is to be announced in 2014. We hope to see you all on Friday 1st November 2013! Application deadline: 16th of September 2013. This Call seeks to fund a truly cross cutting proposal, multidisciplinary, multiyear and/or multiplatform, which needs to mobilise a combination of EUROFLEETS Research Vessels (RVs) together with other appropriate scientific tools like nationals RVs, research planes or onshore infrastructures with their own EC or national funding. All EUROFLEETS RVs and equipment are available for this call. This Call offers fully funded Marine Equipment time within participating scientific marine equipment (2x 3D HD TV Cameras, 2x ROV and the sea floor drill rig MARUM-Mebo) to be deployed from RVs or from underwater vehicles funded by other sources than EUROFLEETS2. Une émission spéciale duJardin extraordinaire consacrée à l’Antarctique sera diffusée sur la Une de la RTBF le 19 mai 2013 à 20h10. Du 20 au 29 mai, Bruxelles accueille la Réunion de Parties au Traité sur l’Antarctique : 400 experts, scientifiques, décideurs politiques et personnalités internationales actives dans la protection de l’Antarctique seront présentes (le Prince Albert de Monaco, Michel Rocard…). Le 22 mai : Journée Internationale de la Biodiversité. Thématique : les eaux douces. L’Antarctique sera mise en vedette car elle constitue un milieu riche en biodiversité, un vivier pour la recherche et une présence scientifique belge historique. Plus près de nous, les eaux douces ne seront pas oubliées avec un reportage sur la restauration d’une gravière alsacienne. Un aperçu d’un projet réussi de préservation et le point de départ d’une réflexion sur la nécessité de préserver les milieux d’eau douce de notre pays. Diffusion sur la Une de la RTBF le 19 mai 2013 à 20h10. Durant la semaine, les 22, 23 et 24 mai, Ketnet diffusera également trois émissions consacrées à l’Antarctique, tout spécialement destinées aux enfants. Sur le site de Ketnet, des jeux en ligne permettront de découvrir la richesse de la biodiversité en Antarctique ainsi que les activités de nos chercheurs belges. Ces jeux ont été réalisés grâce au financement de l’Etat fédéral (SPP Politique Scientifique, SPF Affaires Etrangères et SPF Santé publique, Sécurité de la chaîne alimentaire et Environnement). Antarctica laat ook Karrewiet niet koud! Van woensdag 22 mei tot en met vrijdag 24 mei brengt het jeugdjournaal Karrewiet (Ketnet) om 18u. elke dag een reportage over Antarctica. Op de Karrewiet-website komen er ook verschillende spelletjes over Antarctica. Van 20 tot 29 mei 2013 wordt in Brussel het 36e Antarctica-congres georganiseerd, waar 400 experts, wetenschappers, beleidsmakers en internationale namen (o.a. de prins van Monaco) samenkomen om zich te buigen over de bescherming van Antarctica. van woensdag 22 tot en met vrijdag 24 mei geeft een “kindreporter” in 3 reportages het antwoord op de volgende vragen: wat is Antarctica en het Antarctica-verdrag, hoe het is om er als onderzoeker te leven en werken en wat hebben de kinderen van haar klas geleerd over Antarctica en de klimaatopwarming? vanaf woensdag 22 mei kunnen kinderen op de Karrewiet-website www.ketnet.be/karrewiet 4 verschillende spelletjes over Antarctica spelen; een broeikasspel, een zoekspel, een quiz en een schuifpuzzel. Ook de RTBF besteedt aandacht aan het thema: op zondag 19 mei gaat de uitzending “Jardin extraordinaire” op la Une over Antarctica, gevolgd door een documentaire over zoet water, naar aanleiding van de Internationale dag van de Biodiversiteit op 22 mei die dit jaar in het teken staat van water. Deze 2 projecten zijn een samenwerking met de FOD Volksgezondheid, Veiligheid van de Voedselketen en Leefmilieu, de POD Wetenschapsbeleid, de FOD Buitenlandse Zaken. Meteoriet van 18 kilogram, ontdekt op Antarctica, tentoongesteld in het Museum voor Natuurwetenschappen van 21 tot en met 30 mei. 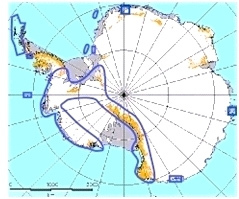 Ter gelegenheid van de Antarctic Treaty Consultative Meeting (ATCM), die dit jaar plaatsvindt in Brussel (van 20 tot 29 mei), zal deze meteoriet uitzonderlijk tentoongesteld worden in het Museum voor Natuurwetenschappen, van 21 tot en met 30 mei. Adres : Vautierstraat 29 - 1000 Brussel. Pendant 10 jours, une météorite de 18 kg collectée en Antarctique va être exposée au Muséum des Sciences naturelles, à Bruxelles. Bringing the Poles to Brussels! De poolgebieden komen naar Brussel! Accueillons les pôles à Bruxelles! (20-29 May 2013), the young Belgian researchers of the Association of Polar Early Career Scientists (APECS) Belgium feel that it is time to get public attention for the poles! We think that this is an excellent opportunity for families, kids, students and teachers to learn more about the polar regions. In particular, it is a chance to gain more knowledge about their conservation, the historic role of Belgium in scientific research on Antarctica, the importance of current research and global climate change! Therefore, we are organizing a science fair in the weekend of 25 and 26 May 2013. This outreach event is open for everyone and will take place at the Academy Palace, a beautiful building in the center of Brussels. Hence, we hope to welcome everyone who is interested in polar science, or in the polar regions in general! Belgium is delighted to host the 36th Antarctic Treaty Consultative Meeting (ATCM XXXVI) as well as the 16th meeting of the Committee for Environmental Protection (CEP XVI). until the 15th of May 2013. This Call seeks a truly cross cutting proposal which needs to mobilise a combination of EUROFLEETS Research Vessels (RVs) together with other appropriate scientific tools like nationals RVs, research planes or onshore infrastructures with their own EC or national funding. All EUROFLEETS RVs and equipment are available for this call. The “Expression of Interest” is not binding but desirable. Logistically accepted pre-proposals will be invited to submit a full proposal from the 14th of June till the 16th of September 2013. The call for proposals for summer 2013 and winter 2013/2014 field seasons is open on the INTERACT website on 1st-31st October, 2012. Transnational Access is available to user groups, where the group leader and majority of group members work in an institution established in a EU Member State or Associated State. The maximum amount of access is 90 person-days per user group. You can find eligibility rules and application instructions, including list of sites and person-days available for TA, INTERACT Station Catalogue and registration to on-line application system from the INTERACT website. Register to the on-line application system already now, and apply INTERACT Transnational Access to conduct research at the coolest places of the North! For additional information, please visit the INTERACT website or contact WP4 coordinator Hannele Savela, or WP4 leader Kirsi Latola. College Belgique: session spéciale “L’Antarctique dans tous ses états"
A for sale/wanted notice board is provided within COMNAP. List of Unwanted Electronics Equipment Hewlett Packard 8640A Signal Generator Farnell SSG1000 Synthesised Signal Generator Hewlett Packard 8558B Spectrum Analyser with 182T Display ISO-Tech ISR622 Oscilloscope 20MHz x2 When last used the equipment worked OK. The equipment is available for a niominal £25 each plus shipping. Freely available via Belspo at simple request. The fastest way to search is to choose ‘Detailed Search’. Samples may be requested by ‘clicking’ on the Sample Bag icon. Once all of the samples have been chosen, the user will be asked for a brief description of the planned research. Many collections are waiting to be cataloged, so if you are interested in a particular region, formation, rock type etc., please email me (or use the curator link on the website) and I will see if we have upcoming collections that would be useful. We also have magnetic susceptibility metadata for thousands of samples, available upon request. 108 Scott Hall, 1090 Carmack Rd.